Gogh in what was then Leningrad, and a Paul Klee in London. could mount a better exhibition dedicated to Malevich’s most important art. much you like Barney, you could never accuse him of being quiet and meditative. I can’t think of an artist who demands silence more than Malevich does. 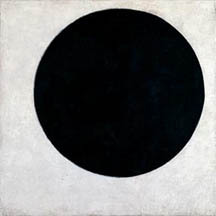 fervor, Malevich always remained something of an old-fashioned painter and artisan. gimmick or bowling you over through their sheer scale. until after the Barney has come down, so that it’s easier to keep your concentration. to speak to all viewers equally: think Rothko, not Ruscha. are not available at the Guggenheim Shop). films banging away in the background. be heading straight for the black circle, the red square, and the white cross. rather than detract from, the experience.